Not to be confused with Jack Law. 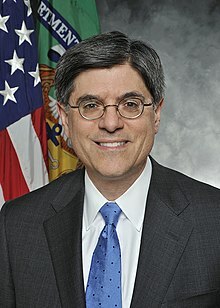 Jacob Joseph "Jack" Lew (born August 29, 1955) is an American attorney and Democratic Party politician who was the 76th United States Secretary of the Treasury, serving from 2013 to 2017. He also served as the 25th White House Chief of Staff from 2012 to 2013 and served as Director of the Office of Management and Budget in both the Clinton and Obama Administrations. Born in New York City, Lew earned his A.B. from Harvard College, then a J.D. from Georgetown University Law Center. He began his legal career as a legislative assistant to Representative Joe Moakley, and as a senior policy adviser to former House Speaker Tip O'Neill. Lew then worked as an attorney in private practice before joining Boston's office of management and budget as a deputy. In 1993, he began work for the Clinton Administration as Special Assistant to the President. In 1994, Lew served as Associate Director for Legislative Affairs and Deputy Director of the Office of Management and Budget, then served as the agency's Director, from 1998 to 2001, then, again, from 2010 to 2012. Following his work in the Clinton administration, Lew became executive vice-president of operations at New York University, serving from 2001 to 2006, then the COO at Citigroup, from 2006 to 2008. During 2009 to 2010, Lew served as the first Deputy Secretary of State for Management and Resources. 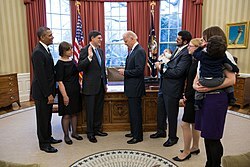 On January 10, 2013, during President Barack Obama's second term, Lew was nominated to replace retiring Treasury Secretary Timothy Geithner, was confirmed by the Senate February 27, 2013, and then sworn in on the following day, serving until the conclusion of the Obama administration, and resigning with the inauguration of Donald Trump. Lew was replaced, on an interim basis, by Adam Szubin, before being officially succeeded as Secretary of the Treasury by Steve Mnuchin. Lew was born in New York City, the son of Ruth (Turoff) and Irving Lew. His family is Jewish. He attended New York City public schools, graduating from Forest Hills High School. His father was a lawyer and rare book dealer who came to the United States from Poland as a child. Lew attended Carleton College in Minnesota for a year, where his faculty adviser was Paul Wellstone, who eventually represented Minnesota in the U.S. Senate. He graduated from Harvard College in 1978 and the Georgetown University Law Center in 1983. He worked as an aide to Rep. Joe Moakley (D-Mass.) from 1974 to 1975. In 1979, he was a senior policy adviser to House Speaker Tip O'Neill. Under O'Neill he served at the House Democratic Steering and Policy Committee as Assistant Director and then Executive Director, and was responsible for work on domestic and economic issues including Social Security, Medicare, budget, tax, trade, appropriations, and energy issues. Lew practiced as an attorney for five years as a partner at Van Ness Feldman and Curtis. His practice dealt primarily with electric power generation. He has also worked as Executive Director of the Center for Middle East Research, Issues Director for the Democratic National Committee's Campaign 88, and Deputy Director of the Office of Program Analysis in the city of Boston's Office of Management and Budget. President Clinton nominated Lew to be Director of the OMB, and the United States Senate confirmed him for that job on July 31, 1998. He served in that capacity until the end of the Clinton administration in January 2001. As OMB Director, Lew had the lead responsibility for the Clinton Administration's policies on budget, management, and appropriations issues. As a member of the Cabinet and senior member of the economic team, he advised the President on a broad range of domestic and international policies. He represented the Administration in budget negotiations with Congress and served as a member of the National Security Council. After leaving public office in the Clinton administration, Lew served as the Executive Vice President for Operations at New York University and was a Clinical Professor of Public Administration at NYU's Wagner School of Public Service. While at NYU, Lew aided the university in ending graduate students' collective bargaining rights. The Obama administration has maintained that Lew supports workers' union rights. According to a 2004 report in NYU's student newspaper, the Washington Square News, Lew was paid $840,339 during the 2002-2003 academic year. In addition, the university forgave several hundred thousand dollars in mortgage loans it made to Lew. In June 2006, Lew was named chief operating officer of Citigroup's Alternative Investments unit, a proprietary trading group. The unit he oversaw invested in a hedge fund "that bet on the housing market to collapse." During his work at Citigroup, Lew had invested heavily in funds in Ugland House while he worked as an investment banker at Citigroup during the 2008 financial meltdown. Lew also had oversight of Citigroup subsidiaries in countries including, Bermuda, the Cayman Islands, and Hong Kong; and during his time at Citigroup, Citigroup subsidiaries in the Cayman Islands increased to 113. Lew with former Chair of the Joint Chiefs Admiral Mike Mullen at the Combined Press Information Center in Baghdad, July 27, 2010. As Deputy Secretary of State for Management and Resources, Lew was the State Department's chief operating officer and was primarily responsible for resource issues, while James Steinberg, who also served as Deputy Secretary of State during that period was responsible for policy. Lew was co-leader of the State Department's Quadrennial Diplomacy and Development Review. On July 13, 2010, the White House announced that Lew had been chosen to replace Peter Orszag as Director of the Office of Management and Budget (OMB), subject to Senate confirmation. During confirmation hearings in the Senate, in response to questioning by Senator Bernie Sanders (I-VT), Lew said that he did not believe deregulation was a "proximate cause" of the financial crisis of 2007–2008: Lew told the panel that "the problems in the financial industry preceded deregulation," and after discussing those issues, added that he didn't "personally know the extent to which deregulation drove it, but I don't believe that deregulation was the proximate cause." On November 18, 2010, Lew was confirmed by the Senate by unanimous consent. The $3.7 trillion 2011 budget President Obama unveiled the administration estimated reductions to federal spending deficits by $1.1 trillion over the next decade if adopted and economic assumptions were fully achieved. Two-thirds of that estimated reduction would come from spending cuts through a 5-year freeze in discretionary spending first announced in Obama's 2011 State of the Union address, as well as savings to mandatory programs such as Medicare and lower interest payments on the debt that would result from the lower spending. Tax increases are responsible for the other third of the reduction, including a cap on itemized reductions for wealthier taxpayers and the elimination of tax breaks for oil and gas companies. Economist and former financial fraud investigator William K. Black warned that the OMB budget statement prepared under Lew's direction was "an ode to austerity," and that austerity would force the U.S. economy back into recession. In an op-ed in the Huffington Post, Lew cited top Administration priorities to achieve deficit reduction; including: $400 billion in savings from non-security discretionary spending freezes, $78 billion in cuts to the Department of Defense, returning to the Clinton-era tax rates for the top 2% of income earners, and lowering the Corporate tax from 35% to 25%. On January 9, 2012, President Obama announced that Lew would replace William M. Daley as White House Chief of Staff. Lew's nomination was followed with criticism after renewed reports that he received over $900,000 in bonuses while working at Citigroup, which had been rescued with $45 billion from the Troubled Asset Relief Program (TARP) after losing $27.7 billion, or 90% of its value. During his tenure as Chief of Staff, Lew was seen as a supporter and top negotiator for a "grand bargain" deal between President Obama and House Speaker John Boehner, to avoid "Fiscal cliff" sequester cuts and tax increases. On January 10, 2013, President Obama nominated Lew for the position of Secretary of the Treasury. The nomination became the subject of some humorous commentary, due to Lew's unusual loopy signature, which would have appeared on all U.S. paper currency for the duration of his tenure; the signature generated enough media attention that Obama joked at a press conference that he had considered rescinding his nomination when he learned of it. Lew later adopted a more conventional signature for currency. The Senate Finance Committee held confirmation hearings for Lew on February 13, 2013, and approved his nomination 19–5 on February 26, 2013, sending his nomination to the full Senate. Lew is sworn as Secretary of the Treasury by Vice President Joe Biden in the Oval Office of the White House, February 28, 2013. During his confirmation hearings before the United States Senate Committee on Finance, Republican Senator Chuck Grassley expressed concern that Lew did not know what Ugland House was, though he had invested in it. Lew had invested heavily in funds in Ugland House while he worked as an investment banker at Citigroup during the 2008 financial meltdown. Lew had taken advantage of current tax law and his financial allocation in the venture resulted in Lew taking roughly a 2.8% loss, a $1,582 decrease in his investment principal. On February 27, 2013, the full Senate voted and approved Lew for Secretary of the Treasury 71–26. He was sworn into office on February 28. In December 2013, Lew said that the government might run out of cash to pay the country's bills by late February or early March 2014. That set up yet another showdown in Congress over raising or suspending the debt limit, a statutory limit on the total amount of United States borrowing, early in the year. "The creditworthiness of the United States is an essential underpinning of our strength as a nation; it is not a bargaining chip to be used for partisan political ends," Mr. Lew said in the letter. "Increasing the debt limit does not authorize new spending commitments. It simply allows the government to pay for expenditures Congress has already approved." In May 2014, Lew received an Honorary Doctorate of Humane Letters from Georgetown University and spoke at the first commencement ceremony of the McCourt School of Public Policy. In 2016, a fictionalized version of Lew appeared in the Mr. Robot season 2 premiere. Lew married his high school sweetheart, Ruth Schwartz. As Chief of Staff, Lew commuted to Washington from the couple's Riverdale, New York home. They have two grown children. Lew is an Orthodox Jew who observes the Jewish Sabbath and has attended Beth Sholom Congregation in Potomac, Maryland, Kesher Israel Congregation in Washington, D.C. and the Hebrew Institute of Riverdale in the Bronx, New York. Interviewed in a 2010 article, Lew's former boss on the National Security Council, Sandy Berger, commented that "Lew's faith never got in the way of performing his duties." A 2011 press release from the Religion News Service noted that Lew also "has extensive connections in the American Jewish community," and that he might be able to help President Obama "build a more friendly rapport" with Israeli Prime Minister Benjamin Netanyahu. ^ a b Jackie Calmes (January 10, 2013). "Lew Would Complete Transformation of Obama's Economic Team". The New York Times. Retrieved January 10, 2013. ^ "Paid Notice: Deaths LEW, RUTH (TUROFF)". The New York Times. 2003-07-23. ISSN 0362-4331. Retrieved 2017-01-22. ^ "Jack Lew's Life Shaped by Faith and Service". The Forward. Retrieved 2017-01-22. ^ "Homecoming". whitehouse.gov. June 27, 2011. ^ "Trusted Aide to Obama Faces Test in Budget Showdown". The New York Times. December 1, 2012. ^ Sullivan, Sean (January 9, 2013). "Who is Jack Lew?". The Washington Post. Retrieved September 13, 2016. ^ "Biographical information on Jack Lew". The Wall Street Journal. January 9, 2012. ^ "Incoming White House Chief of Staff Jack Lew like Rahm sans %@#!". The Hill. January 12, 2012. Archived from the original on March 3, 2014. ^ "Biographical information on Jack Lew". The Seattle Times. January 9, 2012. Archived from the original on March 3, 2014. ^ a b Cook, Nancy (9 January 2013). "Jack Lew: The Man Who Could Save Obama's Legacy". National Journal. Archived from the original on 3 March 2014. Retrieved 14 January 2013. ^ "Van Ness Feldman Congratulates Jack Lew on His Anticipated Nomination to Serve as Head of the White House Office of Management and Budget". VNF. July 13, 2010. Archived from the original on March 3, 2014. ^ "Thompson Schedules Nomination Hearing on Jacob J. Lew". hsgac.senate.gov. May 28, 1998. Archived from the original on March 3, 2014. ^ Pear, Robert (November 15, 2008). "Jacob J. Lew". The New York Times. Archived from the original on July 6, 2012. ^ "Obama's New Chief of Staff Third Gu Alumnus to Serve in Post". Georgetown University. January 18, 2012. Archived from the original on March 3, 2014. ^ "Lew, Jacob J. "Jack"". Our Campaigns. January 26, 2012. Archived from the original on March 3, 2014. ^ "The White House Office of the Press Secretary". Houston, Texas: National Archives and Records Administration. April 14, 1998. Archived from the original on March 3, 2014. Retrieved January 14, 2013. ^ "A Look at the New White House Chief of Staff Jack Lew". Yahoo! News. January 9, 2012. Archived from the original on March 3, 2014. ^ "President Clinton Announces OMB Director Raines' Departure". clinton4.nara.gov. April 14, 1998. Archived from the original on March 3, 2014. ^ "OMB's Organization". clinton3.nara.gov. Archived from the original on March 3, 2014. ^ "Nat'l Security Team Additions". RealClearPolitics. December 23, 2008. Archived from the original on July 7, 2011. ^ Eidelson, Josh. "Jack Lew's union-busting past". Salon. Archived from the original on 3 March 2014. Retrieved 10 January 2013. ^ James Freeman (January 30, 2013). "What Did Lew Do at NYU?". The Wall Street Journal. ^ Kaminer, Ariel. "NYU will cease loans to top employees for second homes". The New York Times. Archived from the original on March 3, 2014. Retrieved August 16, 2013. ^ "Flashback: Lew's Time at Citi And Other Disappointments". Mother Jones. January 9, 2012. Archived from the original on October 10, 2013. ^ "From the Citi to the Caymans". WSJ News. February 12, 2012. Retrieved February 12, 2013. ^ Daniel Halper (13 February 2013). "Jack Lew Oversaw Up to 113 Cayman Island Investment Funds". Weekly Standard. Archived from the original on 3 March 2014. Retrieved 22 February 2013. ^ "Director Jack Lew Blogs About CYNY". cityyearnewyork.wordpress.com. January 18, 2011. Archived from the original on March 3, 2014. ^ "White House Chief of Staff Jack Lew to Keynote December 16 Convocation; Stanley Raskas, Moise Safra and Diane Wassner to be Honored". Yeshiva University. November 26, 2012. Archived from the original on March 3, 2014. ^ "Obama National Security Team Takes Shape". National Journal. December 23, 2008. Archived from the original on December 27, 2008. Retrieved July 13, 2010. ^ "Obama Names Steinberg, Lew State Department Deputies". Bloomberg L.P. December 23, 2008. Archived from the original on March 3, 2014. Retrieved February 6, 2011. ^ "Senior Officials". United States Department of State. Archived from the original on March 3, 2014. Retrieved February 6, 2011. ^ Long, Emily (July 15, 2009). "State Department launches quadrennial review". Government Executive. Retrieved February 6, 2011. ^ "President Obama Announces His Intent to Nominate Jacob Lew as OMB Director". The White House. July 13, 2010. Archived from the original on March 3, 2014. ^ Nasiripour, Shahien (September 21, 2010). "Jacob Lew, Obama Nominee And Former Citigroup Executive, Doesn't Believe Deregulation Led To Financial Crisis". The Huffington Post. ^ "Matt Taibbi & Bill Black: Obama's New Treasury Secretary a 'Failure of Epic Proportions'". AlterNet. January 11, 2013. Archived from the original on March 3, 2014. ^ Wasson, Erik (February 14, 2011). "Obama 2012 budget proposes $1.1T deficit cut over next decade". The Hill. Archived from the original on October 10, 2013. Retrieved November 14, 2012. ^ "Obama's OMB Channels its Inner Tea Party". New Economic Perspectives. December 27, 2012. Archived from the original on March 3, 2014. ^ Lew, Jacob (February 14, 2011). "The 2012 Budget". The Huffington Post. Retrieved January 7, 2013. ^ "Obama chief of staff Bill Daley steps down, budget chief Jack Lew steps up". CBS News. January 9, 2012. Retrieved November 14, 2012. ^ "The new WH Chief of Staff and Citigroup". Salon. January 10, 2012. Archived from the original on March 3, 2014. Retrieved January 7, 2013. ^ "Are These Examples of Washington Corruption?". cato.org. Retrieved January 7, 2013. ^ "OMB nominee got $900,000 after Citigroup bailout". washingtontimes.com. July 28, 2010. Archived from the original on March 3, 2014. Retrieved January 7, 2013. ^ Lipton, Eric (February 11, 2009). "Advisers' Citigroup Ties Raise Questions". The New York Times. Archived from the original on January 16, 2013. Retrieved January 7, 2013. ^ "BUSTED: Obama's New Budget Chief Got A $900K Bonus From Citigroup After It Got A Bailout". Business Insider. July 29, 2010. Archived from the original on March 3, 2014. Retrieved January 7, 2013. ^ Bray, Chad (December 5, 2012). "Citigroup Inc". International New York Times. Archived from the original on January 9, 2014. Retrieved January 7, 2013. ^ "Likely Treasury Secretary Under Fire for Signature". ABC News. January 9, 2013. Retrieved January 9, 2013. ^ Rachel Weiner (January 10, 2013). "Obama mocks Lew's signature". The Washington Post. Retrieved January 10, 2013. ^ Goldfarb, Zachary A. (June 18, 2013). "Treasury Secretary Jack Lew unveils new signature after quibbles with his scribble". The Washington Post. The Washington Post Company. Retrieved July 29, 2013. ^ Kelsey Snell (February 26, 2013). "Senate Finance approves Jack Lew nomination for Treasury". Politico. Archived from the original on March 3, 2014. ^ "From the Citi to the Caymans". WSJ News. February 12, 2012. Retrieved February 21, 2013. ^ Timothy W. Coleman (February 16, 2013). "Politically inconvenient taxation". Washington Times Communities. Archived from the original on March 3, 2014. Retrieved February 18, 2013. ^ "Jack Lew Gets Enough Senate Votes to Be Confirmed as Treasury Secretary". CNBC. Archived from the original on March 3, 2014. Retrieved February 27, 2013. ^ Annie Lowrey (December 19, 2013). "Congress Is Warned Anew Not to Breach Debt Ceiling". International New York Times. Archived from the original on March 3, 2014. ^ Riesman, Abraham (13 July 2016). "How Mr. Robot Got President Obama to Say 'Tyrell Wellick'". Vulture.com. Archived from the original on 23 June 2017. Retrieved 23 June 2017. ^ "Mr. Robot: Which (Mostly) New Characters Live Only In Elliot's Mind?". MTV News. Retrieved June 24, 2017. ^ a b c Wisnieski, Adam (January 16, 2013). "Riverdalian named for top treasury post". The Riverdale Press. Retrieved December 17, 2016. ^ "14 things you should know about Jack Lew". The Washington Post. January 7, 2013. ISSN 0190-8286. Retrieved December 17, 2016. ^ a b Wagner, Ellis, White House Correspondent, "Clinton's Budget Brain Returning to OMB Helm," Politics Daily, July 16, 2010, retrieved February 5, 2012. ^ "Obama names Jack Lew new chief of staff". Ynetnews. Retrieved January 9, 2012. ^ Hoffman, Allison (April 3, 2013). "A School for D.C.'s Jewish Elite". Baltimore Jewish Life. Archived from the original on October 22, 2014. Retrieved December 2, 2014. ^ Donn, Yochonon. "Jack Lew: Liberal Jew, White House's First 'Gabbai'". Hamodia. Retrieved January 3, 2013. ^ Gibson, David (January 10, 2012). "New White House Staffers, Cecille Munoz and Jacob Lew, Have Strategic Catholic, Jewish Ties". The Huffington Post. Retrieved February 5, 2012. Wikimedia Commons has media related to Jacob Lew. This page was last edited on 22 April 2019, at 20:32 (UTC).